The nature of a book like this, with eighteen contributors, doesn’t leave the reader with many consistent themes. It may also drive you to despair, given how much energy is spent finding difference, when the actual policy gap between the contributors is not that great. However, it has the advantage of being a bite sized read and does give a fair picture of where the left in Scotland is at today. Posted in: Books, Ideology, Labour, Outside Left, SNP. What constantly seems to be the case with these discussions is that they fail to analyse what the actual state of play is in terms of support for socialist ideas (in or out of the Labour Party) and trade union struggle. And it remains the case that there is no – I repeat no – greater militancy or trade union activity in Scotland than there is anywhere else in the UK despite all the referendum huff and puff. And that then cuts the legs from all the arguments about Scottish separate development and different politics – the British working class remains united, both positively in its’ unified trade union structures and negatively in its current passivity. And in that situation all talk of nationalist separation and division (which is what much of the Scottish left appears to have been sucked into to a greater or lesser extent) remains the reactionary dead-end that it always was. 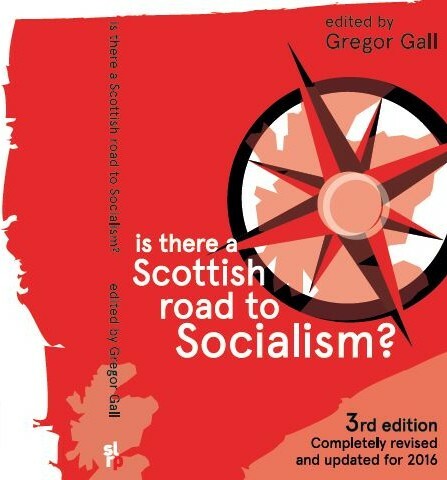 There is no Scottish Road to Socialism, there are no national roads to socialism at all, there is however a Scottish Road to Revolution. I recommend the Scottish working class take that road. The entire Scottish Left Nationalist proposition is bogus – based on tailing the completely historically nonsensical SNP “Scotland as oppressed nation” mythology, and proposing that “Scottish” capitalists and workers somehow have a genuinely greater shared identity of cross class interest than the Scottish working class actually have with their English, Welsh, and Northern Irish working class brothers and sisters. prospects of an “independent” capitalist Scotland , tasked as it would be with competing as a tiny economic unit in an ever more competitive recessionery global economy, with oil prices now stuck around the $40 a barrel level. Losing the Independence Referendum was , for the SNP, actually its greatest good fortune. A nominally “independent ” Scotland would be bankrupt by now given the current oil price. Having “lost” the referendum the SNP , and their Left apologists have dodged the “reality bullet” and have been able to carry on as before – “left faking” as being “Anti Austerity” – whilst actually implementing Austerity for the capitalist class with great gusto. And all the while getting political cover by blaming “the English” under the euphemism of “The Westminster Elite”. I read an excellent piece by a Scottish academic in a recent New Statesman and he argued well that Scotland had quite a social democratic tradition but that Scottish Labour Party deserted this swallowing New Labour hook, line and sinker so the SNP were happy to fill a popular void. We can see off the ultra left in Scotland – the bourgeois socialists – with their ready made programmes who if they can only deposit these programmes into the heads of the working class/working people then their top down leadership will deliver socialism FOR the working class. I don’t support independence but a more Federal Britian but I think the only hope for Labour in Scotland is a grassroots–led, bottom up, participatory, left wing democratic socialism WITH the working class/working people. The SNP are born again social democrats who offer crumbs to working class/working people; Scottish Labour should offer power and a redistribution of wealth.